Bai Yan, a kindhearted police dog handler from China, has spent the last 7 years and around 1 million yuan ($150,000) on a retirement home for police dogs. He has created a safe place where his former “comrades in arms” could live out their golden years in peace. 55-year-old Bai has been working as a police dog handler since 2004, during which time he has trained around 30 canines. Spending so much time with the animals, he became very attached to them, and having seen how some retired police dogs ended up, he knew he had to do something about it. 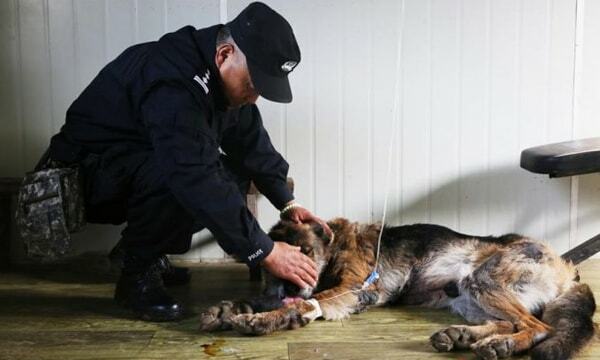 The trainer recently told Chinese media that one of the things that convinced him to open a retirement home for police dogs was seeing an old police dog who had been completely neglected by his new owner lying in the dirt with a chain around its neck and a bowl of spoiled food in front of him. Retired police dogs are usually put up for adoption with the general public, and there is very little vetting of potential owners. Bai is 55 years old and sprightly compared to the retirees in his care, but he says all old dogs are young at heart. In addition to making sure the dogs get enough general exercise every morning and afternoon, he keeps their detective skills sharp with a variety of games, such as hiding balls for them to find. Looking to adopt a shelter dog, try Petfinder.